Amazing visibility in a small package. The RADBOT 1000's blinding 1-watt LED is identical to the lights used in car brake lights, making you as visible as every other vehicle you're sharing the road with. 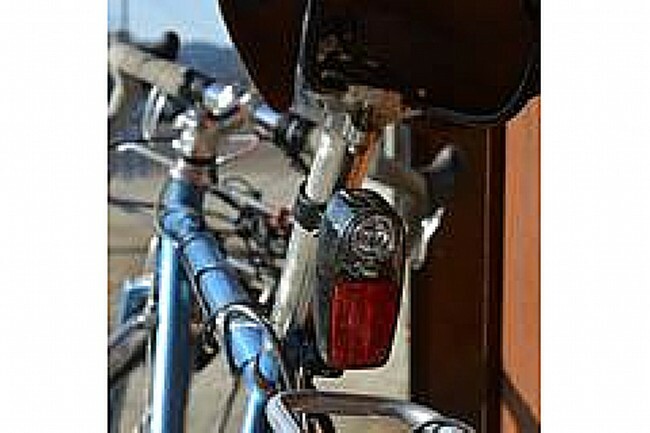 If that wasn't enough, an advanced reflector is sure to grab attention and meets the stringent EU safety standards. Belt clip and mounting bracket for seatpost, bags, or racks. 50 hour burn time (includes batteries). Three light modes. Brighter than other flashes I have had. Almost obnoxious if you are riding behind one. But then that's a good thing to be seen by approaching cars. I'll be getting another one. Early mornings and late evenings, dawn & dusk, this really helps to draw the motorists attention that there is something different on the road up ahead as they are coming up on me from behind. Nice and bright, several modes, easy to mount with various thickness of rubber strips to fit different diameter seat posts. Would recommend this product. Makes biking safer with different settings. The product is very bright, ensuring i'm seen, & it's also super convenient, it will either mount or clip anywhere. will definitely recommend, as I won't need to buy another soon (they're very long lasting). This thing works great, has great battery life, and is exceptionally visible on the road. 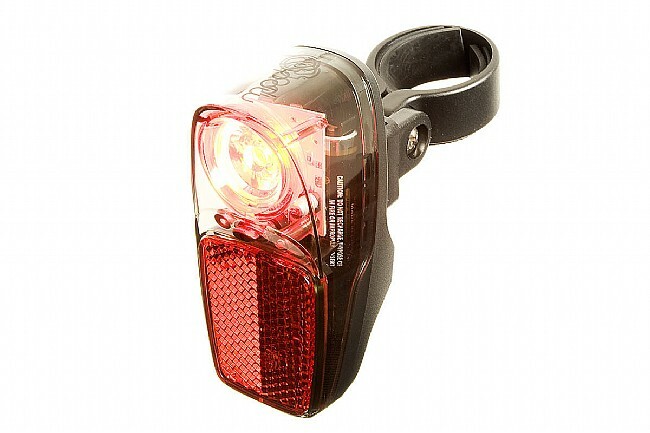 The clip is also compatible with Planet Bike rear light (I upgraded from the Planet Bike Blinky). It turns onoff only after you hold the button for 2 seconds, so it doesn't It turn on or off accidentally while on your bike or while it's stowed in a backpack once you've taken it off. It comes off and clips in really easily to prevent theft. I'm an avid commuter biker who rides at night in the winter months, and I feel much more comfortable on the road knowing I have this light. If $15 bucks is the difference between your life or a cheaper light, what will you buy? So bright it hurts to look at it. I mount this on my seat bag. This is by far the brightest light that I or any of the riding group has used or seen. It only has the one LED bulb but you would never know. This is a must buy. I bought a Planet Bike Super Flash tail light several years ago as it was the brightest light you could get for the money. Portland Design Works has outdone the PBSF with a 1 watt LED (PBSF uses a 12 watt LED). Fortunately the Radbot and the PBSF use the same mounting bracket so they are interchangeable. I highly recommend getting this light, and possibly even getting a PBSF because it never hurts to have more lights and the different patterns from the two lights allow you to be seen better. I just bought this tail light for my bike. I am impressed with the power of this little led, it is amazingly bright with just one LED. Also I love the fact that it comes with clips for seatpost, rear fork and rack. I installed the one for racks on my cruiser bike rack and the seatpost clip on my road bike so I can easily switch between one and the other with no hassle. Also, unlike many other tail lights I had, this one has only 3 flashing modes and you can just switch off any time by pressing longer. This is a great advantage over the other irritating lights with 5 or 7 modes and you have to press the button multiple times to switch off. Very good product. 11 of 13 customers found this review helpful. This is my new favorite rear light. I really like that it is solidly joined together so when dropped does not explode in multiple bits. The reflector is a great addition and the strobe pattern really gets attention. The lights I have used in the past would get water into them and short them out. This one has proven not to do that. The 500 is a great deal as well and gets you a bit longer battery life. This light is not as economical as a rechargeable one in that it needs batteries. We used these lights on a week long cycling trip where recharging was not available. These worked well and lasted the full week, on flashing mode, for up to 6 hours a day. Only 1 set of batteries were needed. I am pleased with the PDW Radbot 1000 rear light. It is very bright. The button to turn it on/off is conveniently placed, and having to hold it for a moment is a nice feature. The installation instructions weren't great, but once I figured out how it attaches, I was able to mount it on my seat stay precisely how I had wanted to. The overall quality seems good, solid, no apparent fit/form issues. I haven't owned it long enough to comment on battery life. It seemed a little pricey for a rear light. I've been using a Radbot 1000 for commuting the past two years, along with a Planet Bike Superflash and a Dinotte 140R. The Radbot is brighter than the Superflash and the sizzle-pop mode is really attention grabbing. Neither of those lights compare with the Dinotte, which costs considerably more money. Although I prefer the Radbot's signal to the Superflash, it has a couple of drawbacks in comparison. The Radbot uses up batteries much quicker than the Superflash and is also much more troublesome to change batteries (requiring you to unscrew the back cover). nice and bright while it lasted. Really is bright but quits working below 32f. Bright, and so far, has not shorted out in water. This is the brightest and most noticable light I have ever seen. I have had people riding behind me ask to turn it off in broad daylight because it is so bright. This is a great buy. best rear light in the non-rechargeable section. But, i use it with a couple of rechargeable AA batteries. the only thing I've found brighter is hooked up to a large Li Ion battery. This is the thid one I've bought, second 1 watt. the other was the .5 PDW, all were great. I use for commuting in and out of the city at night. Adjustments for different size seat posts and rear racks. I typically only use one setting, the slow,easy, BRIGHT, FAST setting. I drive often and am always baffled by cyclists who run rear lights so dim that you can hardly see them blinking from a block away. If you use this light, you're sure not to be one of them! This is the brightest battery powered rear light I've ever used. When I ride at dawndusk, or in mixed conditions (overcast, rainy, etc.) I feel like this light really allows me to be seen. The only issue I have is that it doesn't get dimmer as the batteries drain, so you'll be out and suddenly find the light has died on you. The fact that it has a built-in reflector helps mitigate this a little, but to avoid it I usually replace the batteries before they need it, which is a bit wasteful. Other than that, I quite like it. a) no significant side lighting capability, b) no water resistance provided, c) AAA batteries instead of AA, d) a flimsy detent on the mount, e) no warning your batteries are going dead. To deal with a), mount more side lights. To deal with b), wrap some transparent vinyl electrical tape 3 places on the seam around the periphery, over the case screw, and over the control button and you'll be water resistant. To deal with c) replace the batteries 2.5 times as often as AA (that's the difference in electrical capacity). To deal with d), be very gentle not to bend and break off the tab to release the light from the mount. To deal with e), be careful to check if the light is still working as you ride, or mount two lights (so one of the two is always likely to be working). All of the taillights in this price range suffer from problems like this Blackburn Mars 4.0 Rear Light. I'm very pleased otherwise with the light, it's bright enough that cars will see you clearly. When I got this light, I went by the video on the company website and the examples I'd seen...where the best feature was a sizzle-sizzle-POP! effect. Unfortunately, this feature has been changed on all current stock, so it is much less attention-getting (matches the version originally sold by PDW only in Japan). The case design also allows water to enter the light in my experience, and requires a screwdriver to disassemble and dry. Better values are the Planet Bike SuperFlash taillights (more attention-getting and opens with a coin, but leaks) or the much brighter Blackburn Mars 4.0 taillight (longer battery life, opens with a coin, brighter and doesn't leak but has no built-in reflector).